The 3rd Annual Convocation of CMR University (CMRU) was held yesterday at the DWANI Auditorium, CMR Institute of Technology (CMRIT) campus, AECS Layout, Bengaluru. 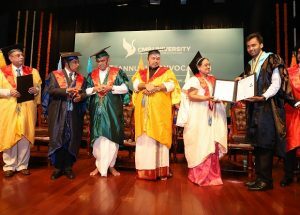 Padma Vibhushana Dr. D. Veerendra Heggade, Dharmadhikarigalu, Sree Kshetra, Dharmasthala was the Chief Guest for the event and he delivered the convocation address. Highly acclaimed Vedic Scholar and Researcher, Daivajna K.N. 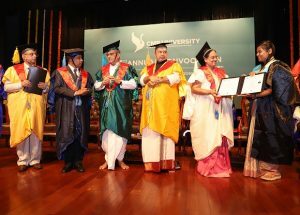 Somayaji was awarded the Honorary Degree of “Doctor of Literature” (D.Lit.) in recognition of his distinguished contributions in the field. KM Amar & Loganayagi of LLM Commercial Law and LLM Constitutional Law won the Gold medals in their respective areas.